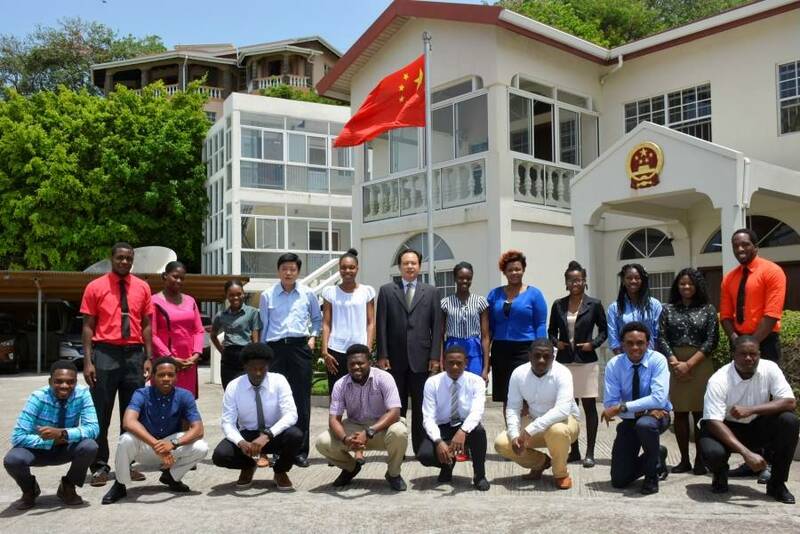 On 17 July, Chinese Ambassador HE Dr Zhao Yongchen met with the 18 Grenadian recipients of the 2018 China Government Scholarship, at the Chinese embassy in Grenada. Ambassador Zhao pointed out that since the resumption of diplomatic relations between the People’s Republic of China and Grenada, many excellent Grenadian students have gone to China through the Chinese Government Scholarship Programme. A large number of professional and technical personnel from various fields have gone to China to participate in short-term training programmes, which have made important contributions to the economic and social development of Grenada. The exchanges between China and Grenada have also effectively promoted friendship between the countries. The ambassador encouraged the students, while in China, to overcome all difficulties, adapt to the learning environment, study hard, increase their talents, and then finally return to serve their country, to effectively contribute to the economic and social development of Grenada, and be a good civil ambassador of China and Grenada. The students expressed their gratitude to the Chinese Ambassador for the support and assistance from the Chinese government and people, determined to cherish this precious opportunity to study hard and strive to return to the country to serve. These students are recommended by the Ministry of Education of Grenada, selected by the Chinese Embassy in Grenada, and are awarded the Chinese Government Scholarship and eventually admitted to more than 10 universities such as Zhejiang University, Shanghai University of Traditional Chinese Medicine. They head to China to for their doctoral or bachelor’s degrees in the summer.